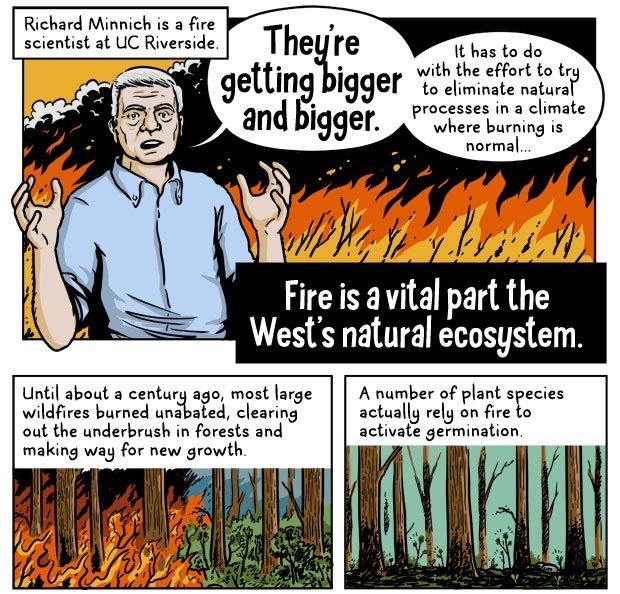 UC Riverside's Richard Minnich is featured in a KQED infographic on wildfires created by artist Andy Warner. Wildfire frequency is increasing, and the fires are getting bigger, hotter and more destructive, explained artist Andy Warner in an infographic posted on KQED's The Lowdown, a website that connects the newsroom to the classroom. The source of information for the 10-panel comic was research by Max Moritz, UC Agriculture and Natural Resources Cooperative Extension specialist, and his colleagues. Moritz' 2014 research is titled Large wildfire trends in the western United States, 1984-2011. Warner also referenced an article by Moritz and colleagues published in Ecosphere called Climate change and disruptions to global fire activity. Warner's infographic features images of and quotes by Richard Minnich, a UC Riverside earth sciences professor. "They're getting bigger and bigger," Minnich is quoted in large, bold print in front of a blazing fire. "It has to do with the effort to try to eliminate natural processes in a climate where burning is normal." Americans' resolve to quickly extinguish wildfires began after a devastating fire season in 1910, which burned millions of acres of forest and killed scores of firefighters. Aggressive firefighting efforts since then have changed U.S. forest ecology, providing excess fuel in forests that lead to larger, hotter blazes. In order to protect people and property while maintaining forest health, American firefighting agencies and UC ANR researchers are seeking to adapt management strategies. "There's been fire ever since there's been oxygen in the atmosphere," Minnich is quoted in a speech bubble. "It's been going on for a third of a billion years, and it's not as though we're ever going to stop it."